Why they are used for CHP? Steam turbines have been generating power in America for many years. Power generated by steam turbines have lit the first light bulbs and propelled our ships for over 100 years. In fact, the first power plant (run by Thomas Edison using his dynamos and located at Pearl Street in New York City) was a CHP plant that generated power using a steam turbine. The excess steam was used to heat homes. Today, most of the electricity produced in the United States is done so by steam turbines. It is safe to say the steam turbines are a known, well understood and proven technology. Because a steam turbine runs off of steam produced by a boiler, it can support many different types of fuels. Natural gas, coal, nuclear, wood, municipal solid waste and more can all be used to run a steam turbine. As a result, facilities that have an excess of waste products such as oil or wood tend to implement steam turbines. 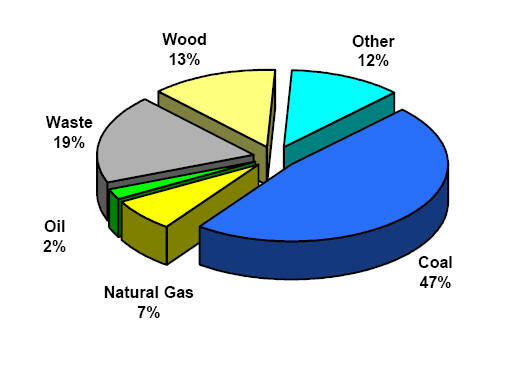 As the figure below indicates, current steam turbine CHP systems run off of a variety of fuels. Another attractive feature of steam turbines is that they can be modified to fit any CHP system. Therefore, the steam turbine can be fitted to match a facilities pressure and temperature requirements. Furthermore, steam turbines can be retrofitted into an existing steam system. Furthermore, water and steam are very well understood. Using the steam tables, we can know exactly the properties of our working fluids at certain temperatures and pressures. Therefore, steam is very predictable. Steam turbines are slightly different than other CHP prime movers in that they require a separate boiler or "HRSG" (Heat Recovery Steam Generator) to create its working fluid (steam). Sometimes, plants will already have a boiler producing steam for a process or to satisfy a heating/cooling load and rather than using a "pressure reducing valve" to "isenthalpically" reduce the pressure of the steam, they will run the steam through a "back pressure steam turbine" and generate electricity. In CHP applications, a boiler or HRSG will generate steam which will be put through a steam turbine. The steam turbine will produce electricity and the remaining exhaust steam can be used for hot water or heating/cooling. The diagram below summarizes a boiler/steam turbine cycle. The basic process behind steam power generation is the "Rankine Cycle". Water is heated until it is a saturated liquid. From there, it is compressed into steam. The steam is transferred to a turbine where the pressure of the steam is reduced (usually to sub atmospheric pressures) by expansion over the turbine blades. This process produces electricity. The low pressure steam is condensed back to a liquid. The water, now referred to as return water, is mixed with new water, referred to as "feed water", and pumped back to the boiler. The figure below shows a common diagram used to describe the Rankine Cycle. The figure above is known as a T-s diagram (Temperature versus Entropy). Step 1 to 2 represents the work done by the boiler. Step 2 to 3 represents the work done by the turbine. Step 3 to 4 represents the work done by the condenser. Step 4 to 1 represents the work done by the pump. There are three types of steam turbines: condensing, non-condensing, and extraction. Condensing turbines are not used for CHP applications and therefore will not be addressed here. Non-condensing steam turbines are also referred to as "back pressure" steam turbines. Here, steam is expanded over a turbine and the exhaust steam is used for to meet a facilities steam needs. The steam is expanded until it reaches a pressure that the facility can use. The figure below, taken from NREL, schematically shows the process of a back pressure steam turbine. The other type of steam turbine used in CHP applications is called an extraction turbine. In these turbines, steam in extracted from the turbine at some intermediate pressure. This steam can be used to meet the facilities steam need. The remaining steam is expanded further and condensed. Extraction turbines can also act as admission turbines. In admission turbines, additional steam is added to the turbine at some intermediate point. The figure below schematically shows the process of an extraction steam turbine. Waste heat from a steam turbine (either collected through the exhaust or from extraction), can be used for space heating or cooling, for process, or it can be used to create chilled or hot water. Steam turbines can also be part of a "combined cycle" process. In these processes, waste steam from an electricity producing process (ie waste steam produced by a gas turbine) is run through a steam turbine to produce more electricity. While this is very energy efficient, it is not considering CHP because no heating or cooling loads are satisfied in any part. Efficiencies of steam systems are hard to calculate. 40-50% is a number that is usually attached to steam turbine efficiencies. However, this number could be misleading because it does not take into account boiler efficiencies. Boilers are generally 80-85% efficient. If such a boiler is included in the steam system, then the efficiency of the steam system drops to 32-42.5%. However, if the boilers are already in place and a steam turbine is added later, then generally the boiler efficiency need not be considered. Another point to consider is if a back pressure steam turbine is replacing a pressure reducing valve or steam blow off practice, then any energy you can get is energy efficient. The reasoning behind this is that the plant was previously loosing energy either by isenthalpic expansion or by simply blowing excess steam away. Now, the plant is using the energy and therefore, when compared to before, the plant is much more energy efficient.